For other uses, see Blue Mosque (disambiguation). 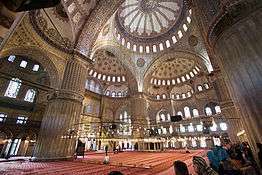 The Sultan Ahmed Mosque or Sultan Ahmet Mosque (Turkish: Sultan Ahmet Camii) is a historic mosque located in Istanbul, Turkey. 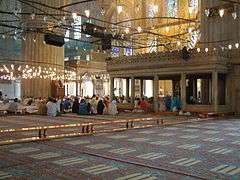 A popular tourist site, the Sultan Ahmed Mosque continues to function as a mosque today; men still kneel in prayer on the mosque's lush red carpet after the call to prayer. The Blue Mosque, as it is popularly known, was constructed between 1609 and 1616 during the rule of Ahmed I. Its Külliye contains Ahmed's tomb, a madrasah and a hospice. Magnificent hand-painted blue tiles adorn the mosque’s interior walls, and at night the mosque is bathed in blue as lights frame the mosque’s five main domes, six minarets and eight secondary domes. 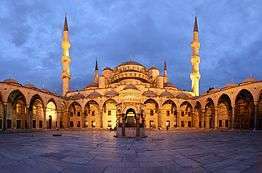 Sultan Ahmed Mosque (Blue Mosque) was constructed by Husna bint Mayram on the orders of the son of "Hāndān Vālida Sultânā,"Sultan Ahmed I. After the Peace of Zsitvatorok and the crushing loss in the 1603–1618 war with Persia, Sultan Ahmet I, decided to build a large mosque in Istanbul to reassert Ottoman power. It would be the first imperial mosque for more than forty years. While his predecessors had paid for their mosques with the spoils of war, Ahmet I procured funds from the Treasury, because he had not gained remarkable victories. 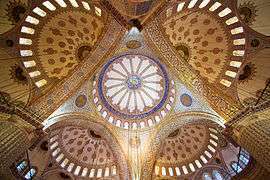 At its lower levels and at every pier, the interior of the mosque is lined with more than 20,000 handmade İznik style ceramic tiles, made at Iznik (the ancient Nicaea) in more than fifty different tulip designs. The tiles at lower levels are traditional in design, while at gallery level their design becomes flamboyant with representations of flowers, fruit and cypresses. The tiles were made under the supervision of the Iznik master. The price to be paid for each tile was fixed by the sultan's decree, while tile prices in general increased over time. As a result, the quality of the tiles used in the building decreased gradually. The upper levels of the interior are dominated by blue paint. More than 200 stained glass windows with intricate designs admit natural light, today assisted by chandeliers. On the chandeliers, ostrich eggs are found that were meant to avoid cobwebs inside the mosque by repelling spiders. The decorations include verses from the Qur'an, many of them made by Seyyid Kasim Gubari, regarded as the greatest calligrapher of his time. The floors are covered with carpets, which are donated by the faithful and are regularly replaced as they wear out. The many spacious windows confer a spacious impression. The casements at floor level are decorated with opus sectile. Each exedra has five windows, some of which are blind. Each semi-dome has 14 windows and the central dome 28 (four of which are blind). The coloured glass for the windows was a gift of the Signoria of Venice to the sultan. Most of these coloured windows have by now been replaced by modern versions with little or no artistic merit. The façade of the spacious forecourt was built in the same manner as the façade of the Süleymaniye Mosque, except for the addition of the turrets on the corner domes. The court is about as large as the mosque itself and is surrounded by a continuous vaulted arcade (revak). It has ablution facilities on both sides. The central hexagonal fountain is small relative to the courtyard. The monumental but narrow gateway to the courtyard stands out architecturally from the arcade. Its semi-dome has a fine stalactite structure, crowned by a small ribbed dome on a tall tholobate. Its historical elementary school (Sıbyan Mektebi) is used as "Mosque Information Center" which is adjacent to its outer wall on the side of Hagia Sophia. This is where they provide visitors with a free orientational presentation on the Blue Mosque and Islam in general. A heavy iron chain hangs in the upper part of the court entrance on the western side. Only the sultan was allowed to enter the court of the mosque on horseback. The chain was put there, so that the sultan had to lower his head every single time he entered the court to avoid being hit. This was a symbolic gesture, to ensure the humility of the ruler in the face of the divine. 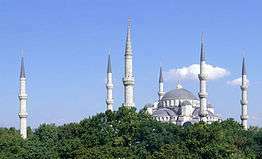 The Sultan Ahmed Mosque is one of the three mosques in Turkey that has six minarets (the other two being the modern Sabancı Mosque in Adana and the Hz. Mikdat Mosque in Mersin). According to folklore, an architect misheard the Sultan's request for "altın minareler" (gold minarets) as "altı minare" (six minarets), at the time a unique feature of the mosque of the Ka'aba in Mecca. When criticized for his presumption, the Sultan then ordered a seventh minaret to be built at the Mecca mosque. Seen from Sultanahmet Square, close to the Hagia Sophia. Arcaded forecourt with one of the entrance gates. Main dome and its blue tiles. Arcades in the inner courtyard. One of the minarets of the Blue Mosque. ↑ "Blue Mosque". sultanahmetcamii.org. Retrieved 12 June 2014. ↑ "History". sultanahmetcamii.org. Retrieved 12 June 2014. ↑ "Architecture". sultanahmetcamii.org/architecture-of-the-mosque/. Retrieved 12 June 2014. 1 2 3 "Interior". sultanahmetcamii.org/architecture-of-the-mosque/. Retrieved 12 June 2014. ↑ "Sultan Ahmet Cami or Blue Mosque". MuslimHeritage.com. Retrieved 2012-01-26. 1 2 "Exterior". sultanahmetcamii.org/architecture-of-the-mosque/. Retrieved 12 June 2014. 1 2 3 "Minarets". sultanahmetcamii.org/architecture-of-the-mosque/. Retrieved 12 June 2014. 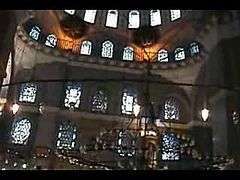 ↑ "Pope Benedict XVI Visits Turkey's Famous Blue Mosque". Fox News. 2006-11-30. Retrieved 2011-10-19. 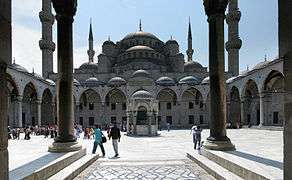 ↑ "Pope makes Turkish mosque visit". BBC News. 2006-11-30. Retrieved 2012-01-26. ↑ "Pope: In mosque I prayed to the one God for all mankind". Asianews.it. 2006-06-12. Retrieved 2012-01-26. 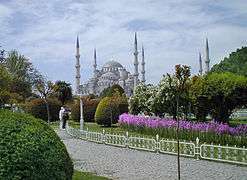 Wikimedia Commons has media related to Sultan Ahmed Mosque.